Today’s post looks at the news that the costs of student accommodation have increased to the point that now more than half of all students in the U.K. pay more than £100 per week for their accommodation, a rise of just under 20% in three years. We have looked at the issue of spiralling costs in this sector before in Financial Regulation Matters, where the call was for regulatory vigilance. However, this news, when paired with the ever-increasing rate of student suicides, the increasing deterioration of students’ mental health, protest after protest against spiralling costs, and fears over the continuing commercialisation of the Higher Education sector, leads one to believe that the time for ‘vigilance’ has passed – what is required now is action. In this post the ever-deteriorating situation will be analysed, and rather than a State, via the Financial Reporting Council, looking to intervene and reduce the pressures upon record numbers of students, the reality of the situation is a State that is looking to capitalise upon the situation and create as much wealth as possible. 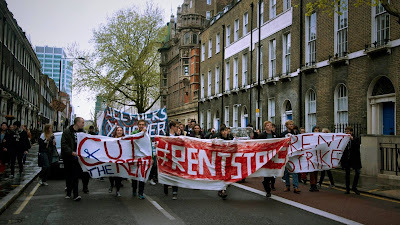 Recently, in The Independent, a news story emerged under the headline of ‘More than half of UK University Students pay more than £100 per week on rent as costs spiral’. The sentiment of the piece was that 51.8% of students in the U.K. now pay more than £100 per week on their accommodation which, the newspaper stated, has resulted in 57% of students now working to pay for the increasing costs (often more than their full-time status allows). 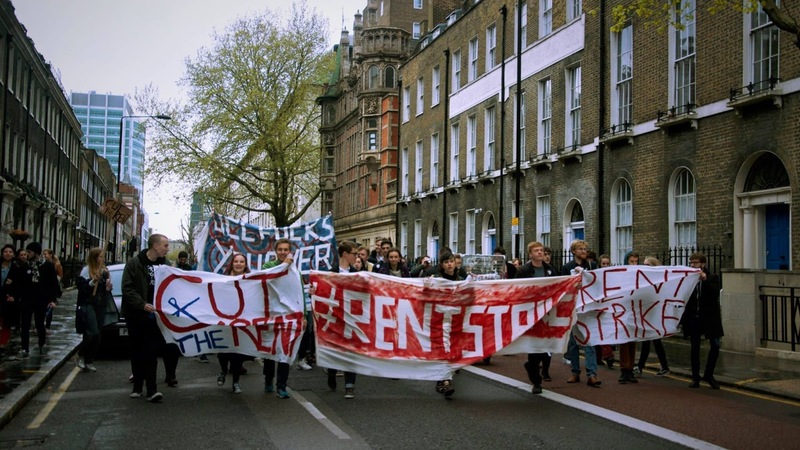 Last year, students at University College London (UCL) protested against the spiralling fees in the form of a 5-month strike, which resulted in the University relenting and offering £350,000 in bursaries for accommodation for the 2016/17 term. More recently, students at the University of Bristol have refused to pay their rent for the Halls of Residence, declaring that ‘the high rents charged by the University have a real and lasting impact upon the welfare of the student population’, whilst there are calls for the University of Bath to lower their prices. However, the University of Bristol countered by saying that ‘the University does not make a profit from residential accommodation and simply seeks to cover its costs’, which alludes to a much larger issue. As far back as 2001, there were claims that ‘students were being priced out of education’ by the ever-rising costs, often much more than the rate of inflation; in 2012 the warnings were repeated on the back of an increased rate of Universities reducing their investment in accommodation in favour of outsourcing the responsibility to private providers, with the University of Reading being cited (as just one example) when it outsourced this responsibility to the building company UPP in exchange for a £200 million investment in its estate. Whilst in theory the purpose of the move is to free up capital for other endeavours, the obvious counterargument is that ‘some of the financing deals might make it quite tricky not to have a continually increasing rent’ – clearly, this fear in 2012 is being realised in 2017. What seems to be the case is that, as one onlooker noted, ‘if things go wrong… it still comes back [to the University]’ after privatisation has taken place. The privatisation of student accommodation is, some suggest, part of a bigger issue of the commercialisation of the Higher Education sector and, in a number of cases, those issues are coming to the fore. The increasing commercialisation of the sector has been noted by staff at UCL in a recent survey which, apart from demonstrating an elevated level of discontent amongst the staff, also shows the actualities of their discontent. As student numbers have doubled to more than 39,000 in just over a decade at the University, the staff have been noted as saying ‘we feel part of an anonymous revenue-driven machine’. However, the opposite argument is that in this day and age Universities must remain commercially viable enterprises. This may be true but, the recent news that annual donations to British Universities have topped £1 billion for the first time, when understood next to the recent rise in tuition fees, makes the ‘commercially viable’ consideration a bitter pill to swallow. However, this is for the Minister of State for Universities and Science, Jo Johnson, to answer. For this post, the call is on the Financial Conduct Authority (FCA) to do much more in regulating the activities of private providers of accommodation – their ability to increase rental charges must be regulated, and better still capped. Some may argue that as private institutions they should be free to do as they wish – in line with the free-market ideals of the Conservative Government – but in actual fact they have a pressing social responsibility and it is imperative that they meet this standard. For the reasoning of this viewpoint - putting the issues regarding protests up and down the country aside for one moment – we need not look any further than the recent news that a Law student from the University of the West of England (UWE) is believed to have committed suicide this month. This tragic news represents the sixth student to have committed suicide in the region (the other five were students at the University of Bristol), and follows on from five suicides by students at the University of York last year alone. Unfortunately, these two Universities grabbed the headlines, but there are many more instances across the U.K. with suicide rates amongst students increasing year-on-year since 2007. Mental health is deteriorating in British Universities and researchers have already begun to make the obvious links between the development of commercialisation and the accessing of mental health services across the sector; this is the clearest indicator that action is required. Whilst there are a number of factors that may affect the progression of a student, some of which are important in developing the graduand, these sorts of excessive financial pressures surely should not be one of them. Ultimately, the FCA must step in to assess the situation and act to ensure that the pathway of a student is not hindered by the actions of private enterprises. Yes Universities must do a lot more, but in this particular realm i.e. private accommodation prices, the State can step in – we must remember that. Universities need to have certain rates of revenues, but at what cost? The incredibly tragic and heart-breaking stories of students committing suicide under increasing pressure, when matched to the almost accepted understanding that a full-time student must work excessive amounts of hours to be able to afford to live and study is symptomatic of a regressive society and, if we pause for a moment, it is important to bear that in mind. The FCA must do more, but will they? In a political arena where ‘strong and stable’ is the official order of the day, the reality of the situation is that ‘money talks’, and there will not be any meaningful endeavour to reduce revenues for the sake of a greater, longer-term good. The situation in the Higher Education sector is particularly bad at the moment, but it is not irretrievable. It is not irretrievable because all it will take is for influential people to take a longer-term vision based upon the collective advancement – the country, after negotiating Brexit, will need skilled graduates from a variety of backgrounds; whether or not the political and financial elite see this is another matter entirely and, as the suicide and mental health rates continue to rise year after year in the sector, the answer to that question becomes ever clearer.